I just checked the IGDA Leadership Forum page and found it updated with session reviews, articles from Gamasutra and even some cool pictures. 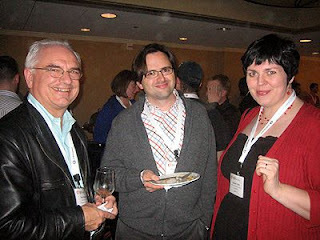 This is a picture of me (right) with my two favorite game industry guys -- Don Daglow (left) and Rodney Gibbs (center). Oh yeah -- on the front page of the Leadership site, there's a nice picture of Mark DeLoura, too!